The compelling storytelling qualities of arguably the greatest story ever told – Christmas - and the perennial desire to escape into fantasy and enchantment at Christmas time, more than at any other time of year, have been the starting point for Selfridges’ new festive season theme: Storytelling. Selfridges itself, having introduced modern retail storytelling and retail theatre to the UK in 1909, courtesy of its eponymous and highly creative founder, has been telling its customers exciting stories for decades. It was only logical to turn the legendary store into a giant house of enchanted stories and fairytales this Christmas. To celebrate the art of storytelling, Selfridges has nominated what it considers to be the 25 most enchanted stories ever told. The 25 stories stretch across different eras and styles as well as themes – they are not all about Christmas, but they all have enchantment in their tale and they have been selected to be at least one generation old – so no Harry Potter in sight. The oldest story featuring within the top 25 is over 300 years old (Sleeping Beauty by the pioneer of the modern fairy tale genre, Charles Perrault) and the most recent to make the cut is Raymond Briggs’ The Snowman first published in 1978. Outside the top 25 most enchanted stories but within the wider context of the celebration of storytelling, Selfridges is also embracing a broader mix powerful, legendary, famous and compelling stories – including the great stories told through media other than print, such as film. This is fitting seen as the Oxford Street store has recently opened the world’s first department store cinema. During the festive season, the Everyman cinema at Selfridges will show a series of enchanted tale-based films including Pinocchio and It’s A Wonderful Life. 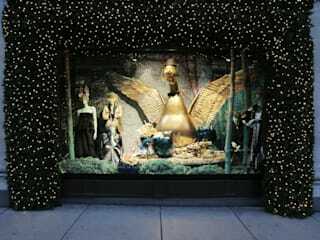 However, Selfridges’ Christmas windows and facade have been designed to be the storytelling celebration’s most visible and most spectacular showcase. Several of the world’s best-loved tales including Cinderella, Snow White and Hansel and Gretel are told through the creative prism of the award-winning Selfridges windows team – all with a cheeky and contemporary twist. 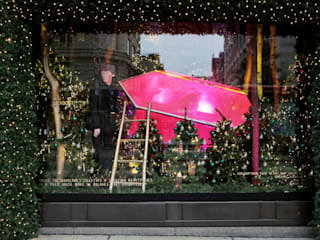 This year, however, the windows won’t be the London store’s only masterful display visible from the street. A dazzling centrepiece installation will vie for attention atop the historic neo-classical Oxford Street canopy. Expressing storytelling in a three-dimensional exhibit, the canopy installation, is over 18 metres across by 10 metres tall and over 3 metres wide. It is made of a mix of polystyrene and aluminium and decorated with 1,000 metres of neon lights and over 10,000 LED lights. Called Destination Christmas, the canopy installation features universal fairy tale symbolisms with a little Selfridges twist, such as the Golden Goose wearing a monocle and a top hat. This new installation weighs over two tons and features the biggest neon sign to be seen in London this Christmas. Storytelling will continue within the store at every turn. In-store visual merchandising displays continue the referencing of iconic features of magical characters and famous tales. An eight-meter long golden tress dangles down from the third floor central atrium where a light show makes a newly created giant golden mobile shimmer. The mobile features – seemingly falling down the atrium - some of the words and pages from a new fairly tale conceived by Selfridges. The Selfridges Christmas story – entirely composed in rhyme - is a clever mash-up of a number of well-known stories which transform into a brand new tale. The Selfridges Christmas story will be available to read in full and to listen to at Selfridges.com where pop-up online radio station extraordinaire, The Butcher’s Apron, has been invited to host regular storytelling slots, bringing some amazing tales to life. 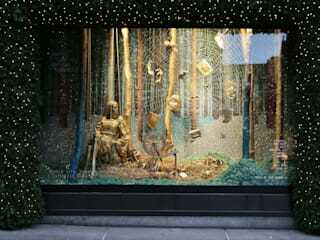 Famously recurrent fairy tale themes such as gold as treasure, enchanted woodlands and mystical forests, symbolic charmed objects such as lanterns, secret magical words, spell-bound mirrors and more have inspired not only the displays within the store, but also a selection of limited edition products sold across all departments.